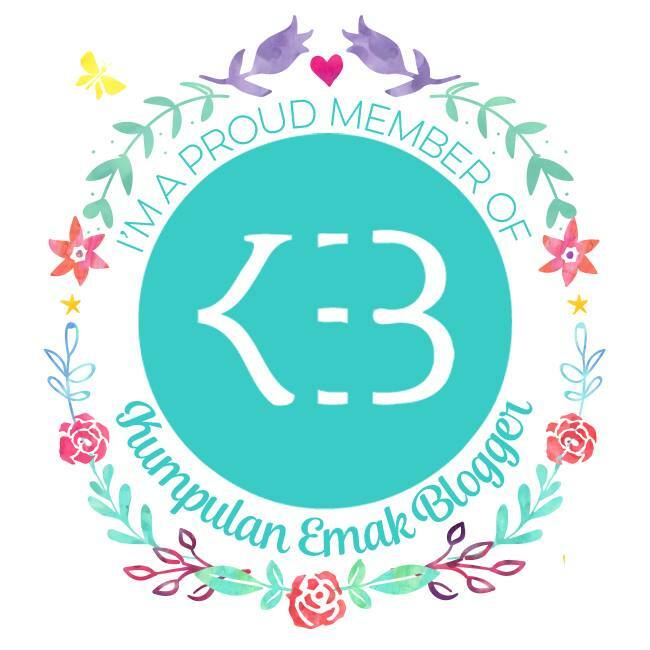 Hi semuanyaaa... sebelum saya mulai bercuap-cuap sudah ada yang mengikuti lomba review berhadiah pulsa? Lumayan loh hadiahnya bagi pemenang pertama adalah pulsa Rp. 100.000,- Batas terakhir adalah tanggal 24 Maret jadi jangan sampai lupa yah. 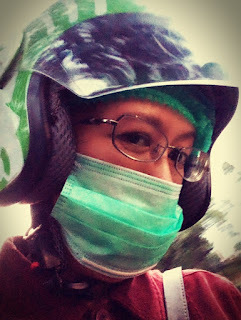 Okay, now I'm going to make my personal review about motorcyle taxis in Jakarta. What? There is a motorcycle taxi here? Yeap... In here they called Ojeg or ojek... The same thing. Since most of the time, Jakarta hit with traffic jam these kind of taxis really help us a lot. Both we, passenger and driver know this kind of transportation is illegal, but we use it anyway. Usually we have to know about the route and more or less about the decent fee to be paid to the driver. It will help if you have Indonesian friend who will give you inside and tips and guidance about this matter. Otherwise, if you are not really a bargaining person then most of motorcycle taxi drivers will rob you blind. But nowadays, even to order motorcycle taxi or ojek can be done by using two applications. 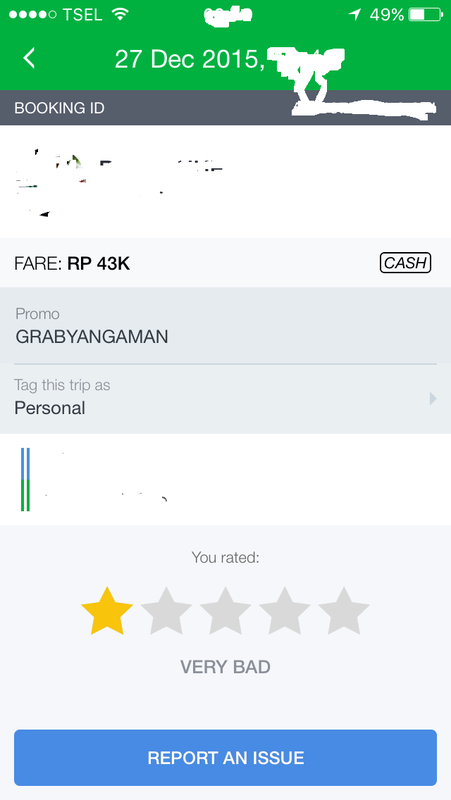 Once I talked about using Grab in this post. But, I think I should talk about both of them: they are Go-Jek and Grab. You can search for them for both android and iOS users. I installed these two as I like to compare which one is cheaper. Make sure you gave them your reachable phone numbers when you first do the registration. I noticed that most drivers in Go-Jek - forgot to check on the other one - all use the same provider. 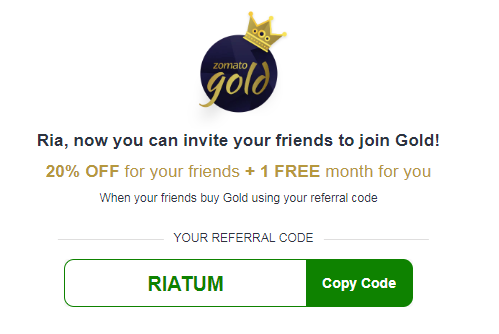 If you are into discount then maybe you prefer to have the same provider with them. Phone numbers with same provider allows you to have discount or free calls in certain time. In theory they should be the one calling you to confirm about your order. But sometimes, they probably running out balance as they are all using pre-paid sim card and you will be the one calling for them. Asking their current location and such. Done with the registration? Then you are now preparing for your first order. Pay attention to terms and conditions of every promotion that they offer. Right now, both Grab and Go-Jek offer flat rate for certain time and calcuated with the distance of your route. The flat rate will changed during rush hour in the morning and late afternoon when everybody try to go home as soon as possible. 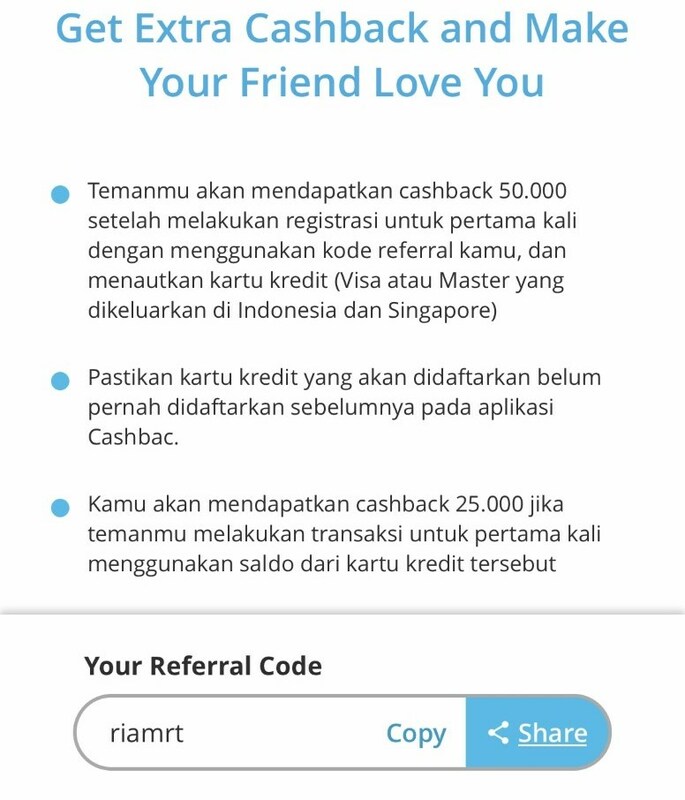 If you are not sure, best ask your Indonesian friend especially those who always using their services. You either decide to have e-wallet that you need to top up the balance. Or like me, prefer to pay with cash. Not accepting payment with credit card or debet card. Better to have small changes (not coins but the smallest amount are IDR 1.000,- or IDR 2.000,- as it will annoys both of you when the driver has no changes for you). These two things should be offered by the driver to their passenger. If they just gave you the helmet then you probably need to ask them politely to give those two things for you. Usually they will answer that they have run out of stock. Which is why you should prepare them by yourself. Why? Without surgical mask you will inhale heavily polluted air. And the head cover to protect your hair as the helmet has been used by many passengers. Make sure the driver KNOW the route to go to your destination. Ask them if they know the route or about your destination. It will be hell if you both have no idea how to get there. Some of them will turn on the GPS. But not sure with the others. Once I had this experience with the driver who has no idea about my destination. Why on earth he pick up my order is beyond my understanding. We end up asking people who give us a correct direction actually. I tried to turn on GPS on my handphone but fail due to bad signal. I end up ask him to just drop me somewherer and decided to try turning on the GPS. This time the signal is good and it turns out I only five minutes away from my destination!!! Don't hesitate to give honest rating for the drivers especially those with bad manner, impolite, messy looking appearance and being rude. I noticed both drivers from Go-Jek and Grab, a few of them doesn't wear the uniform. And when they do, within slightly glance they are all almost look the same. So you need to confirm with them when any of them approaching you, confirm their name and again like I pointed in number 4, ask about the destination. Once I almost get on with Grab while I was actually ordering driver from Go-Jek. Sometimes you need to give more information like when you asked them to pick you up at Kelapa Gading Mall. Which lobby? Near what? What are you wearing? Give all the detail so the pick up process won't be draining both of your energy. P.s. , if you are in hurry then tell the driver to find shortest route or if you know which one just tell him. But if you are not in a hurry, then told him to avoid speeding and just take it slow. Not sure if they are going really slow but nothing wrong to try. 1. 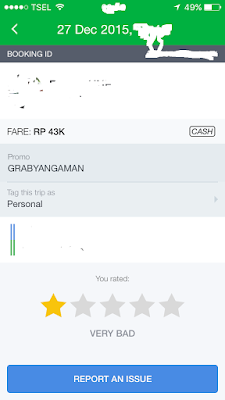 Go-Jek has more variation of services compare with Grab. You are too lazy to go to the restaurant you can order via Go-Food. You are too busy to go to hairdresser then just order them via Go-Glam. Both Go-Jek and Grab offer delivery service for documents and package. For detail you may check with them. Grab give this information to us after the order is being confirmed. So we have information such as the driver's name, his phone numbers and the plate number of his vehicle. 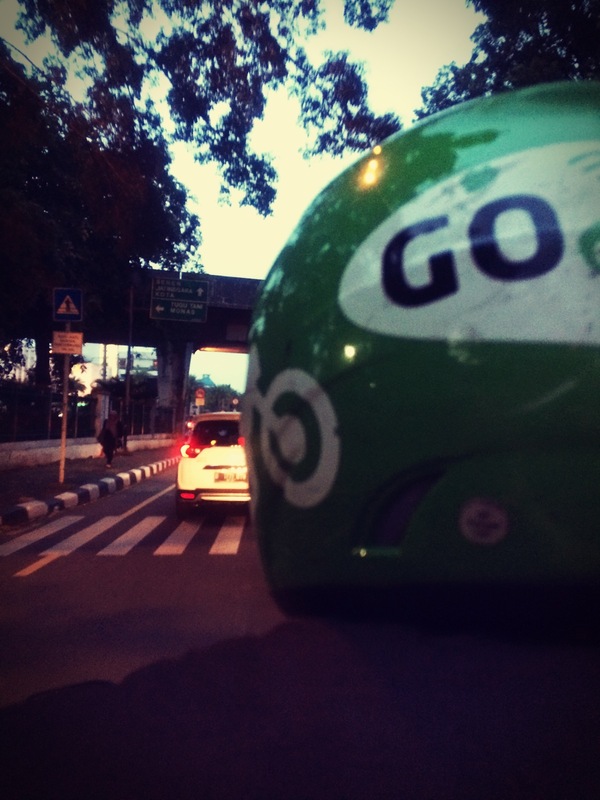 Go-Jek doesn't provide us with the plate number. So we need to ask them are they the driver that we ordered or otherwise. 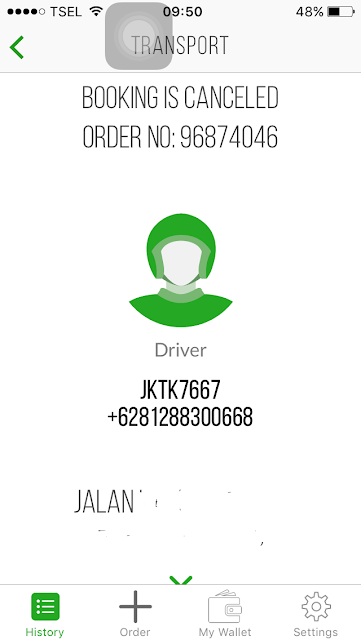 I have never tried to cancel order via Grab but once I cancelled two orders via Go-Jek. Usually you will be asked what is the reason for your cancellation. My first cancellation because the detail of the driver is not clear and unable to be contacted. The second cancellation because the driver is too far away. If you have sudden change of heart and wish to stop at location with shorter distance from your confirmed destination then try to ask the driver about it. Naturally, you will have to pay the stated amount when you confirming the order. If you wish to go further than the real location, again ask the driver about this matter. If your Indonesian is terrible then probably just follow the confirmed destination. By the way don't take selfie like me as it was DANGEROUS. I did this in an empty street during the weekend. Go-jek ini idenya bagus sekali ya mbak... cocok jadi solusi kemacetan Jakarta. Pernah nggak ada kejahatan karena sudah kasi info detail gitu? Nggak cuman diandalin pas macet. Bahkan pas mager beli makan di kos pun bisa langsung buka aplikasi ojek ini hehehe. It has been noticed that in many urban communities of the creating scene taxis make up about portion of the movement in the city of the city. In numerous nations the activity is generally made out of four-wheeled vehicles, however in Vietnam, little bikes make up more than ninety percent of the movement. By the by, of the staying ten percent, taxis constitute the standard half, and the cab drivers get to be master at weaving their way through an ocean of swarming motorcyclists. Taking a taxi in Hanoi in best embraced with the safety belt attached and the eyes shut. While numerous individuals consider motorcyclists the individuals who adoration to ride as a side interest or just in their extra time, there are a few people who are sufficiently fortunate to have the capacity to utilize their cruiser as an aspect of their responsibilities. Much the same as a moving organization has a truck, a few individuals have bikes that are fundamental to their occupations. Riding on a motorcycle has many benefits going with it. For one, you get to squeeze your way through traffic since its small size can go through vehicles.